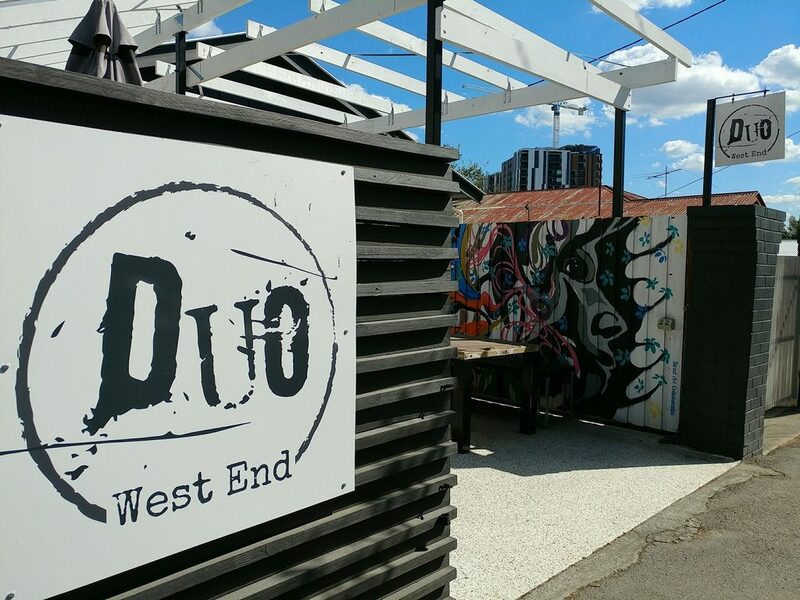 Duo West End is a hidden away eatery in, well, West End. 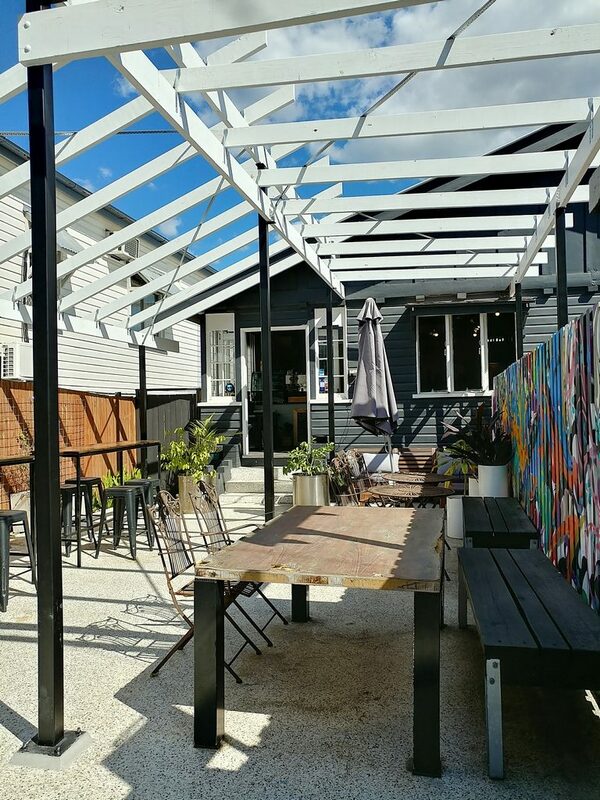 A stone’s throw away from the more crowded Boundary Street, you might not find Duo West End if you stick to the beaten path. It has recently celebrated its second year of being open though, so people are clearly finding their way to it. We received an invitation to visit, and took the opportunity to join the people in the know. A sign, in case you’re a little lost. As we walked up Browning Street, an A-frame at the corner indicated the way to go. 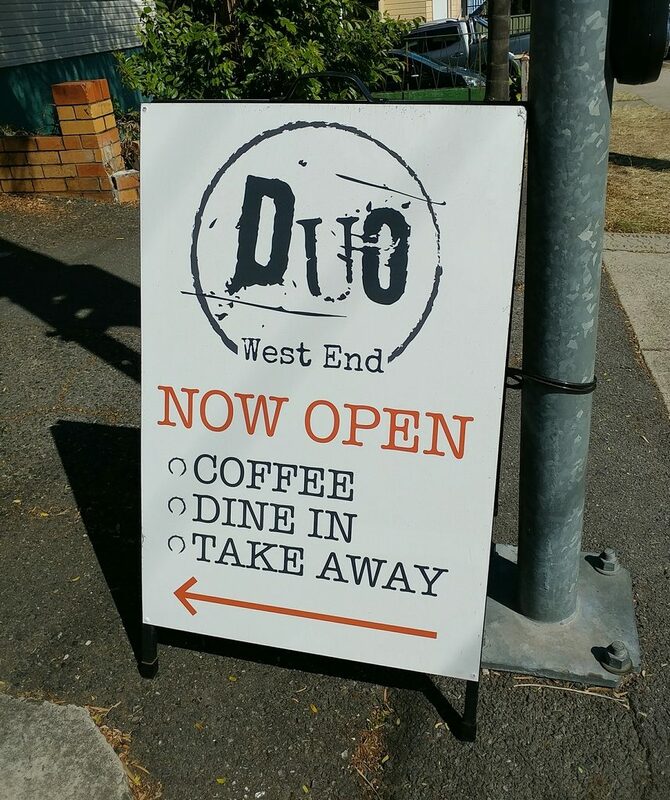 There was clear signage to indicate that we had reached the front of the eatery, with “Duo West End” in black on a white backing on the front wall near the entrance, and hanging like a flag from a post on a pillar. The signs that tell you you are actually there. Duo West End takes up half of the front of a redone worker’s cottage. The exterior is painted a modern slate grey, with the door and window frames in white to lighten the look. 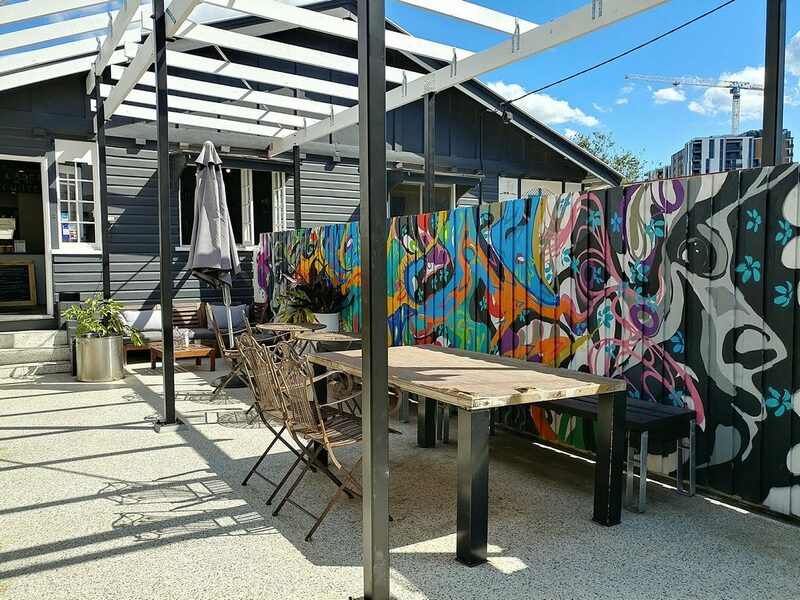 You will come to their outdoor area first, with long tables at both bar and standard height, which would accommodate groups well. An eye-catching mural covers one of the walls, livening up the space. At the time we visited, there were just roof trusses overhead, which while giving a great view of the blue skies on the day, might be less practical at other times. The owner explained that they were in the process of getting new roofing put up, ahead of summer. The outside area, which will eventually be sheltered. The mural along the outside wall. We made our way up to the inside area, which was quite a contrast to the bright outside. Dark floorboards and black painted interiors lighted by the warm glow of exposed filament bulbs hanging from the ceiling give it a speakeasy bar feel. Mounted pictures from a local photographer hung along one wall, adding a touch of colour (these were also available to purchase). At the far end was a large canvas depicting the Storey Bridge and the cityscape behind it. Warm hued wood-topped tables and white chairs with minimalist curved frames further balanced the otherwise dark surrounds. 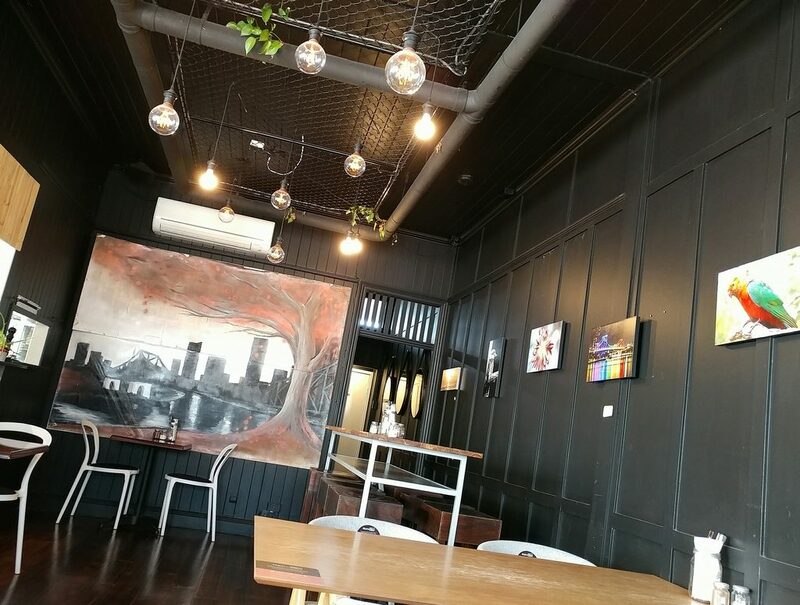 The interior of Duo West End. We were invited to sit at any available table, and we picked a seat by the windows, for the natural light. Water and menus were promptly brought to the table. 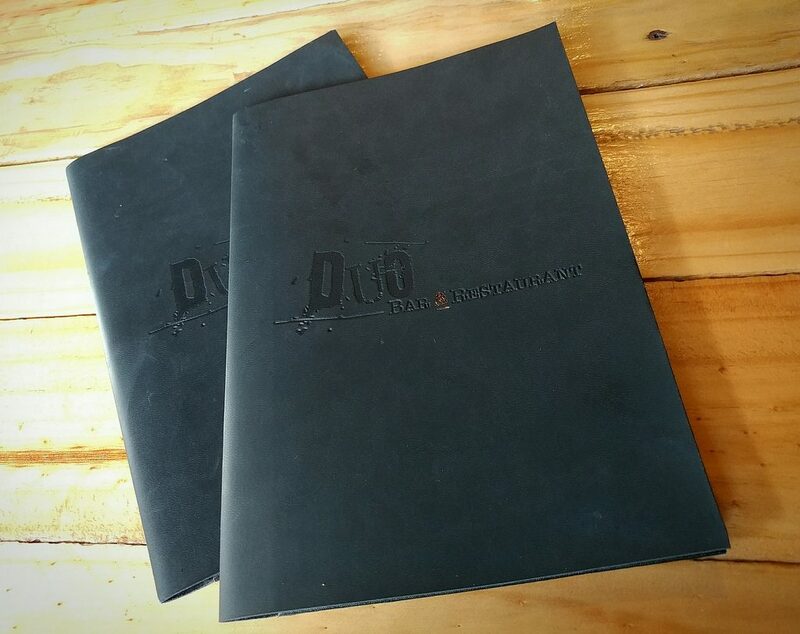 The menu came in a black booklet, the front embossed with their name, from when it was known by the title of “Duo Bar & Restaurant”, with rose gold highlight in the “&”. 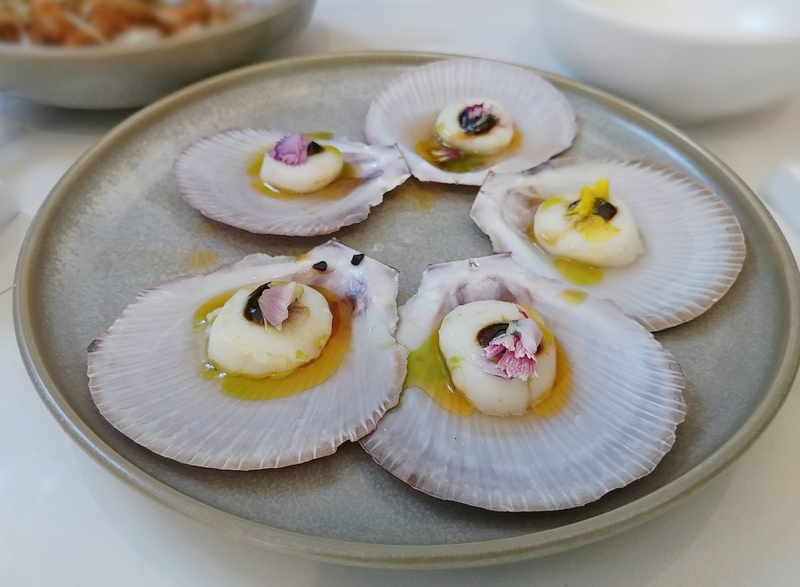 In those pages were food and drink options in a number of sections, with the food options being available all day, and encompassing sweet dishes, popular savoury brunch favourites like eggs benedict, salad bowls, and burgers and rolls. In the drinks section, besides coffees, they also have a number of fresh juices and smoothies. We found ourselves torn between a number of the savoury options, their French Toast Burger (haloumi, bacon, berry compote, maple syrup, cinnamon, and pistachio praline) and the Corn and Potato Stacks (sweet corn, fetta, and potato stacks, herb sour cream, pickled radish and parsley salad) being tempting contenders. In the end though, we decided to have the Chicken ‘n’ Waffles (who can go past fried chicken and waffles? 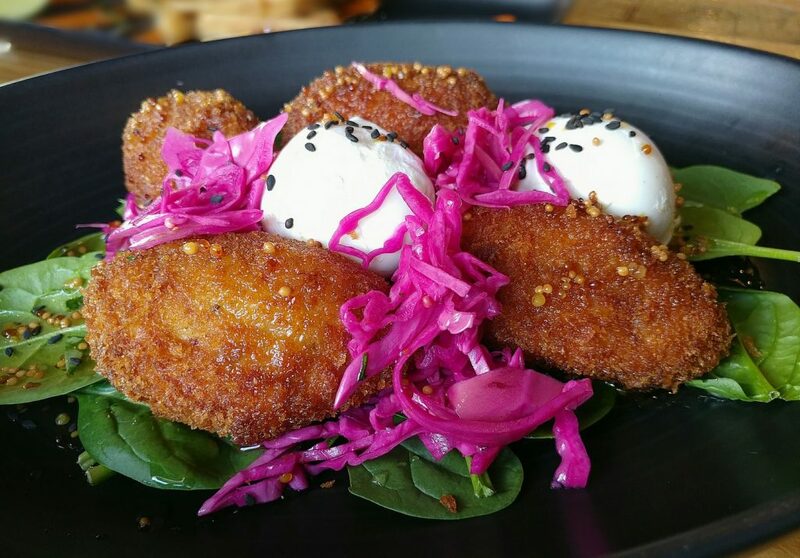 ), and the Croquettes. 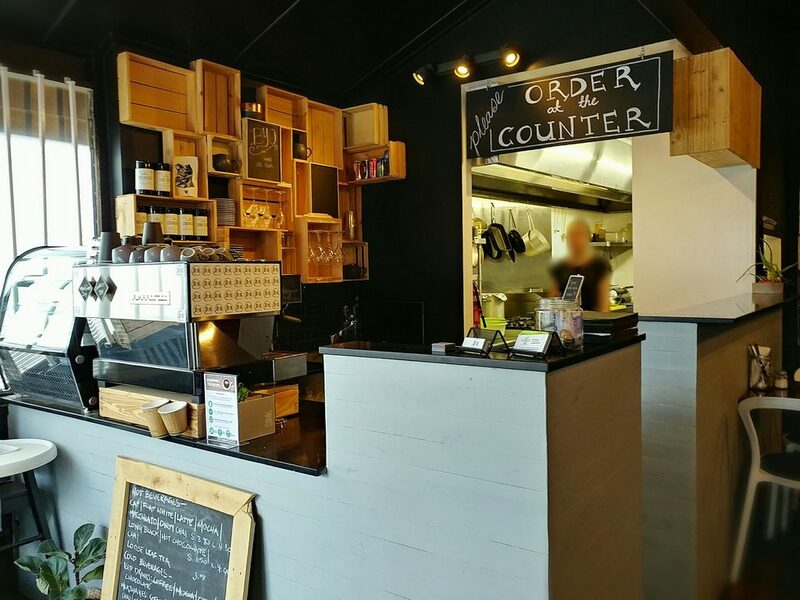 The coffee and service counter, where you order and pay. 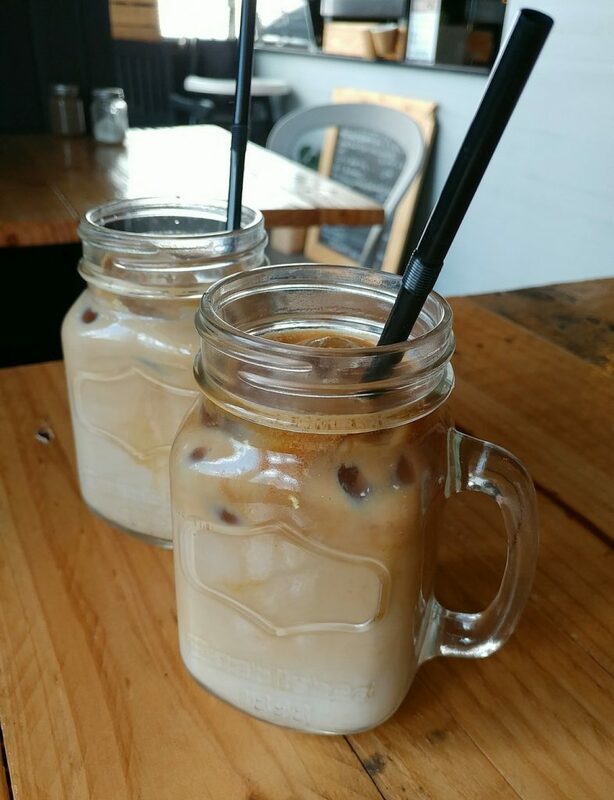 Coffees arrived first, the soy iced lattes served in jar-like mugs. They had a good strength, with nutty flavours and a faintly fruity finish. There was no bitterness to them. 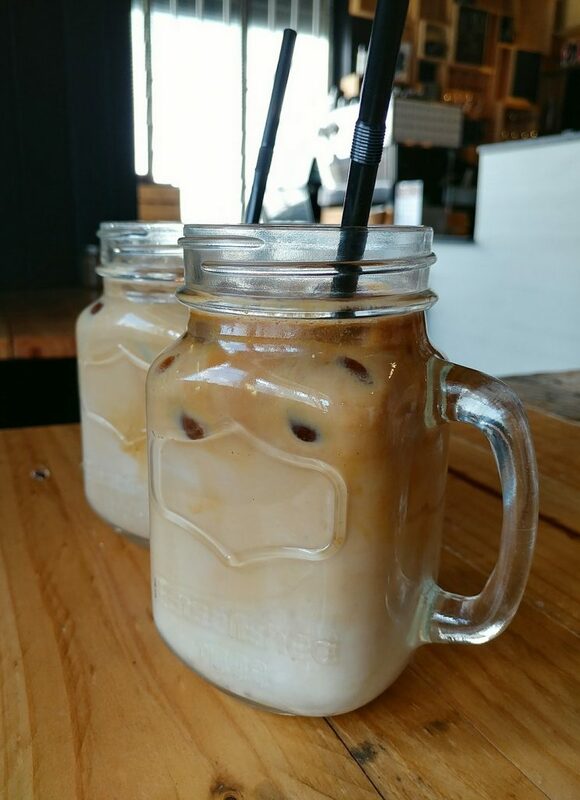 Same coffees, slightly different angles. Both dishes were very pretty when served, plating enhanced by the use of brightly coloured vegetable components, and we couldn’t help taking plenty of pictures before stopping to eat. 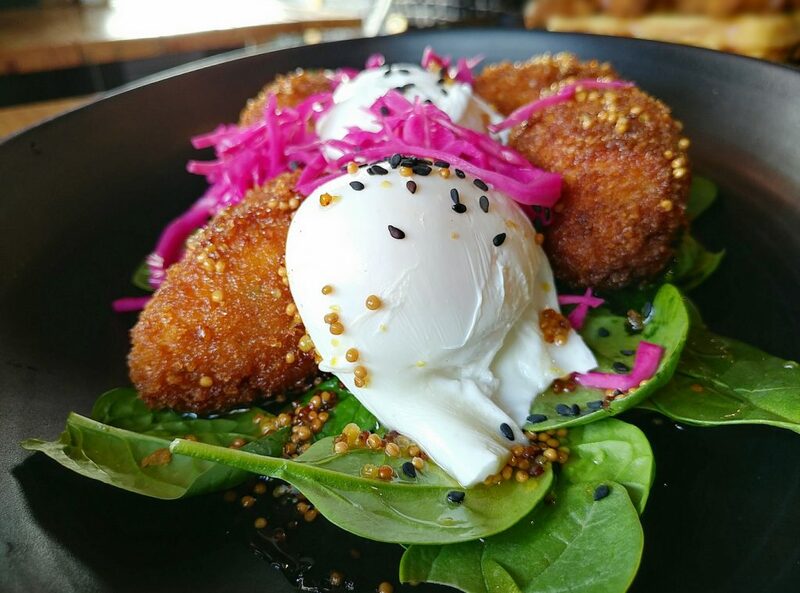 The Croquette dish was listed on the menu as Corned beef, thyme, and potato croquettes, poached eggs, spinach, pickled cabbage, and sticky mustard dressing. 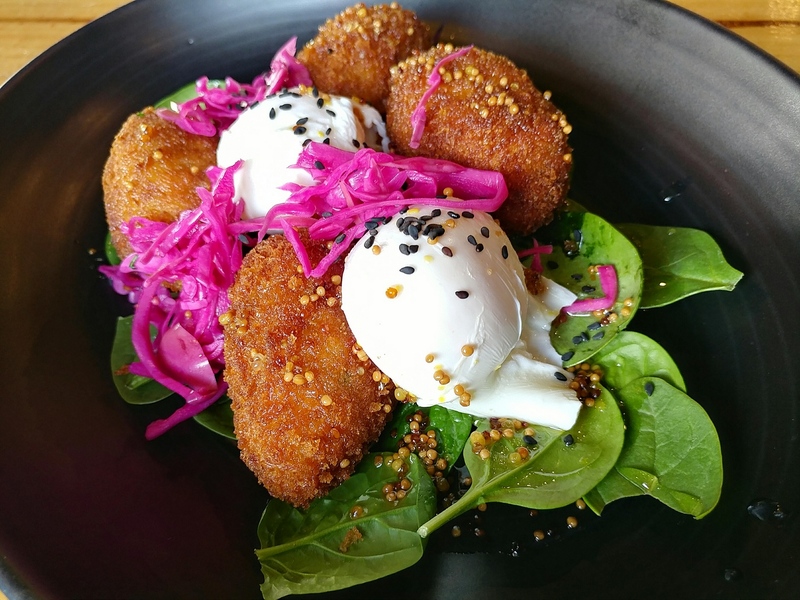 As already mentioned, it was plated prettily, with the golden brown croquettes on a bed of spinach leaves, similarly shaped poached eggs nestled between them, and vibrant fuschia pickled cabbage strips scattered over the top. The croquettes had a good layer of crunchy crumb on the outside, contrasted by the soft potato filling inside. 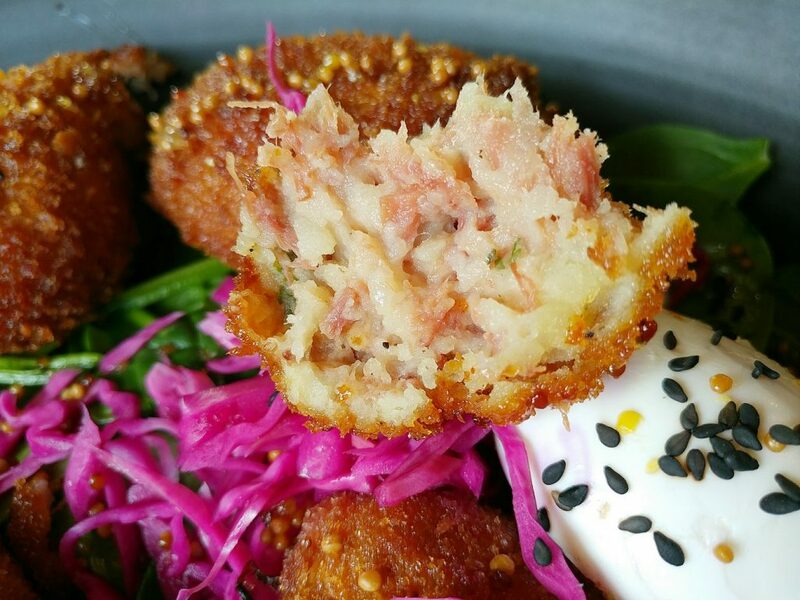 The corned beef was present in more than just a token amount, easily visible when you pulled a croquette apart, and imparting a meaty savouriness. The sticky mustard dressing drizzled over it made a moreish sweet and salty combination with the croquettes. There wasn’t too much of it though, so the croquettes didn’t get soggy. The poached eggs had perfectly runny yolks. The pickled cabbage strips were crunchy, and piquant without being too tart. They brought a bright, fresh note to the flavour mix. It all went together well, and the dish was quite substantial, without making one overly stuffed. 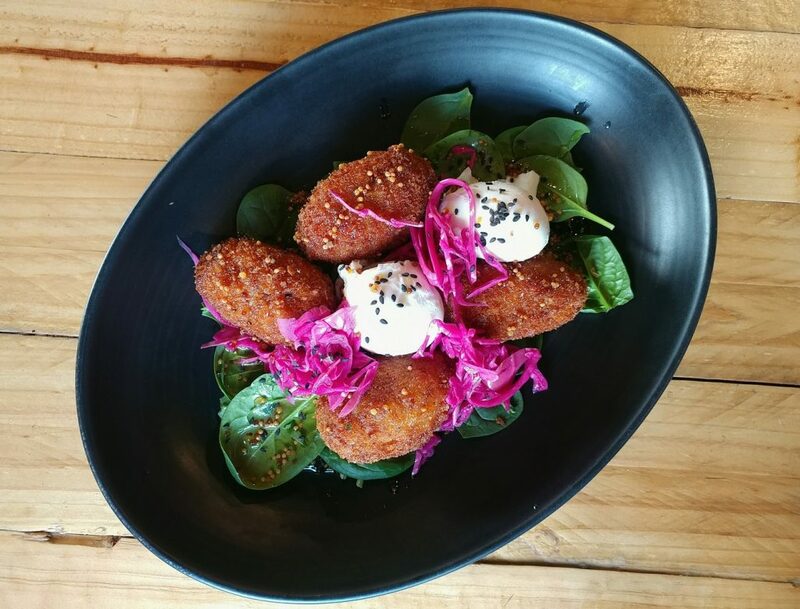 The corn beef, thyme, and potato croquettes, with poached eggs, spinach, pickled cabbage, and sticky mustard dressing. 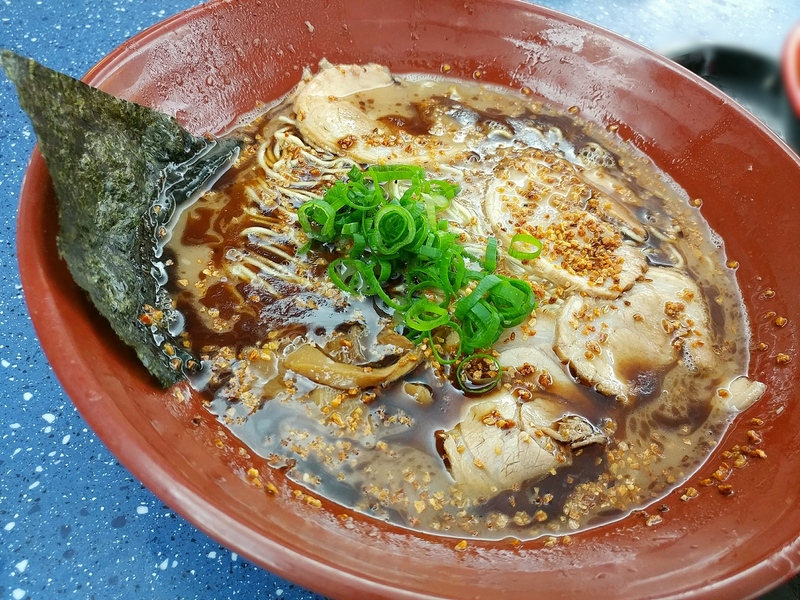 A closer look at the dish. That’s crunchy crumb on the croquettes. 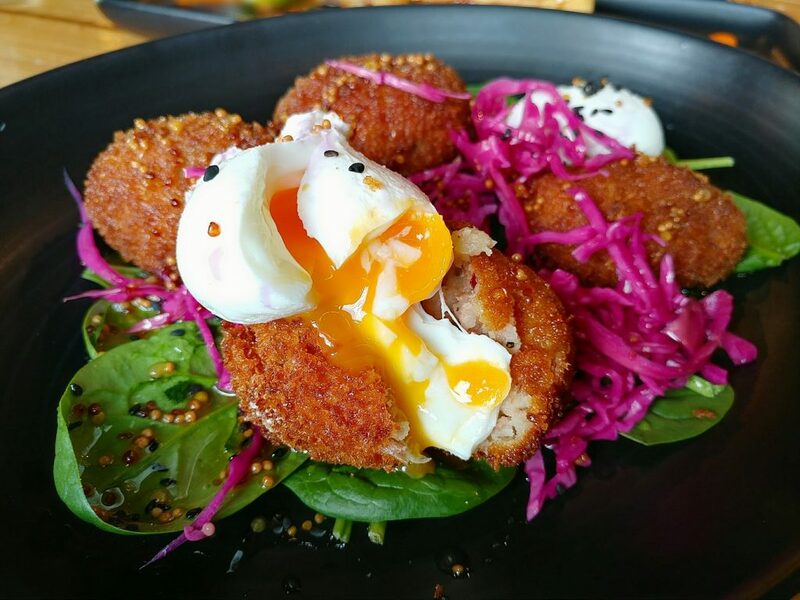 Inside a croquette. More than potato. Can’t miss a runny yolk. 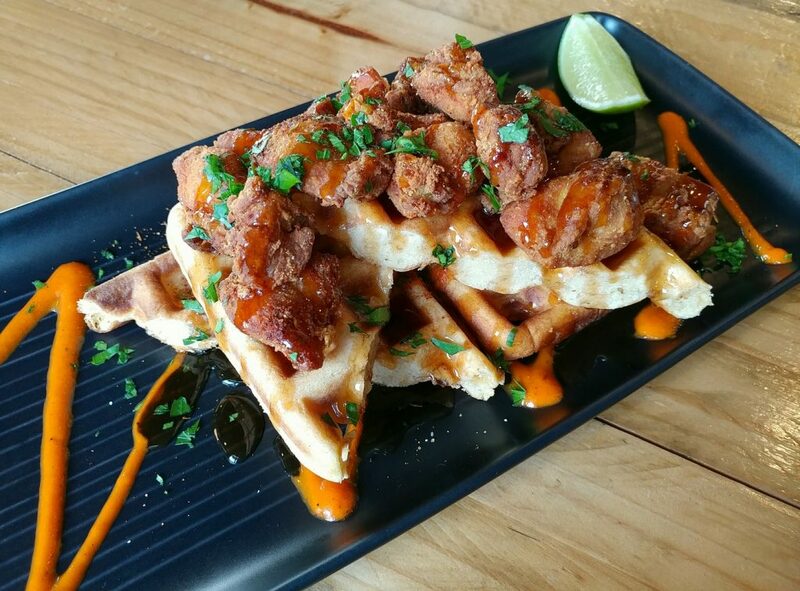 The Chicken ‘n’ Waffles was described in the menu as marinated chicken bites, cajun, maple, red pepper puree, and fresh lime. 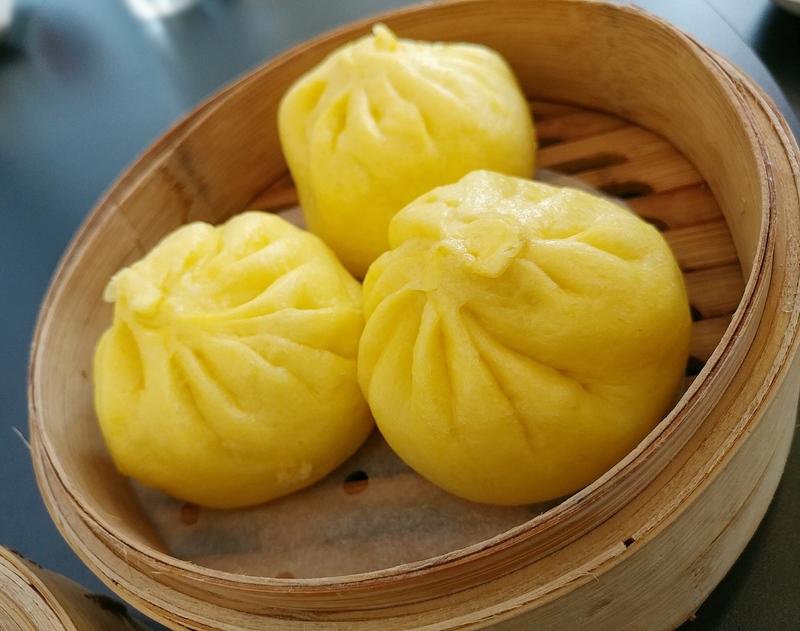 We were told that it was one of the dishes they had had on the menu since they opened. As the aromas of maple and spices wafted up from the plate, we had to say, we didn’t regret joining the many before us who had ordered it. 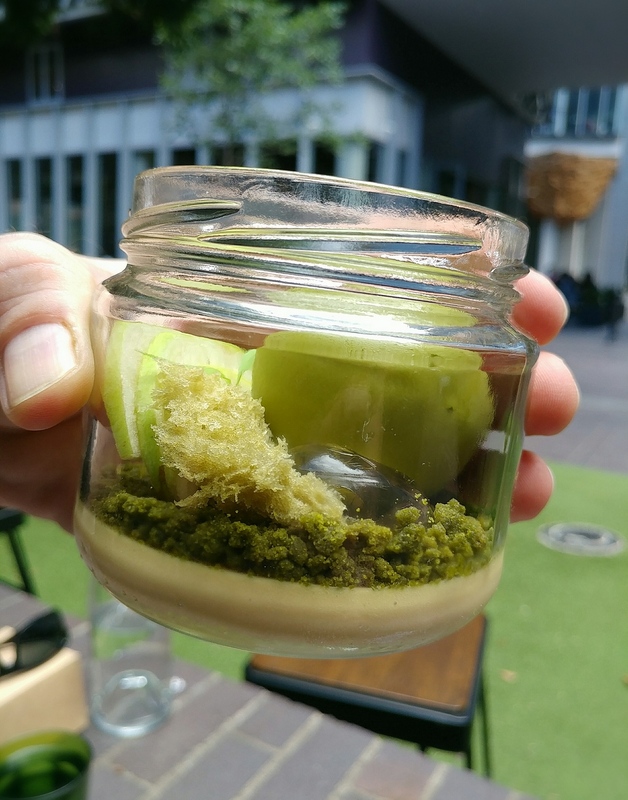 This, too, was appetisingly presented, the fiery orange pepper puree zigzag across the platter and the liberal scatter of chopped fresh green herbs adding punch to what would otherwise be quite a monochromatically brown dish. The waffles had crunch on the outside, and were dense once cut into, but not stodgy. The chicken bites had a fine crumb coating that was well seasoned. 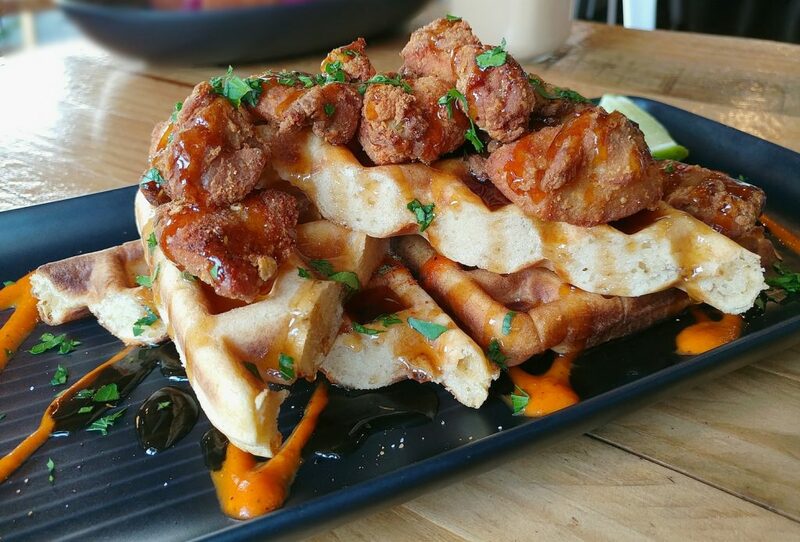 When we had had chicken and waffles at other places, larger pieces of chicken breast had been used instead, and unfortunately, in a likely attempt not to undercook the middle of the chicken while crisping up the outside, they had overcooked the chicken instead, leading to tough, dry meat. In this case, however, the smaller chicken bites had a better crumb to meat ratio, and were cooked just right. There was a good amount of maple syrup drizzled over the chicken and pooled in the waffle grids, and besides sweetness, it imparted a rich, almost toasted note. 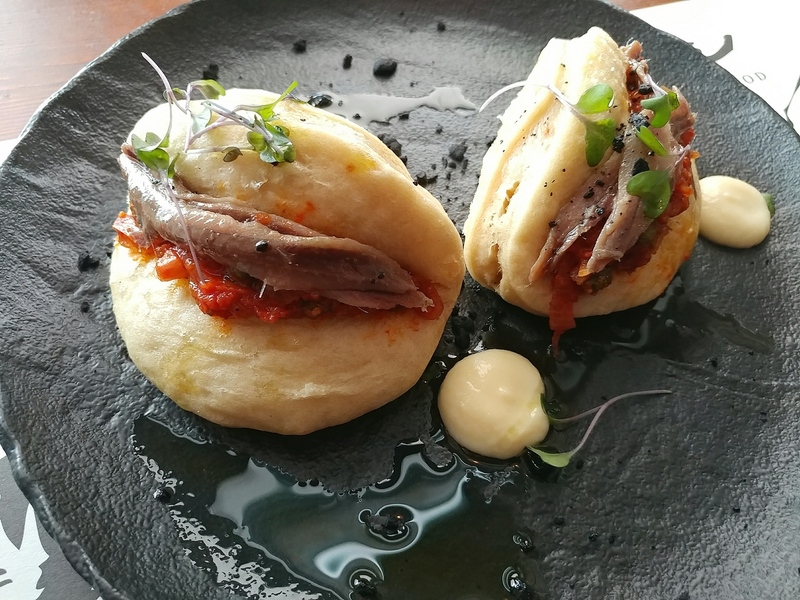 The red pepper puree wasn’t spicy, despite its appearance, and certainly had concentrated capsicumy flavour, adding some freshness to what might otherwise be a bit of a heavy dish. 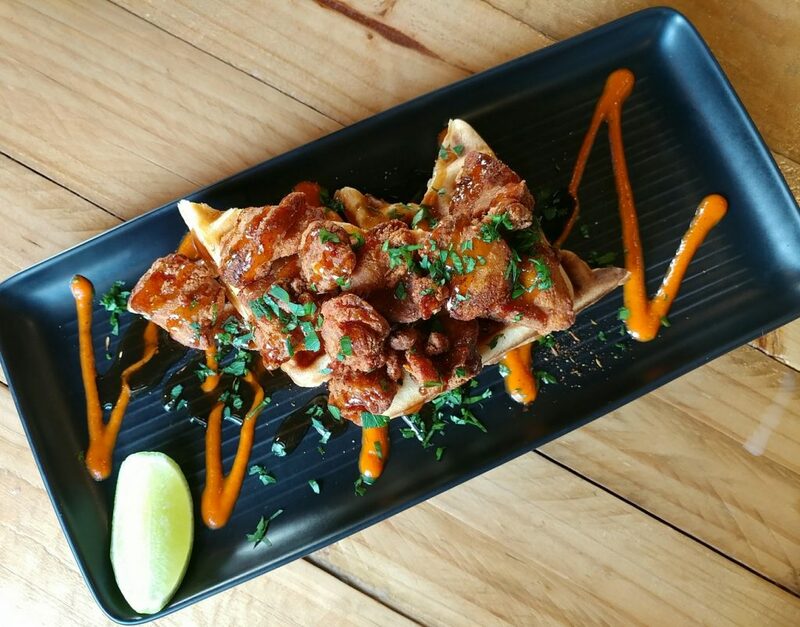 The waffles with marinated chicken bites, cajun, maple, red pepper puree, and lime. 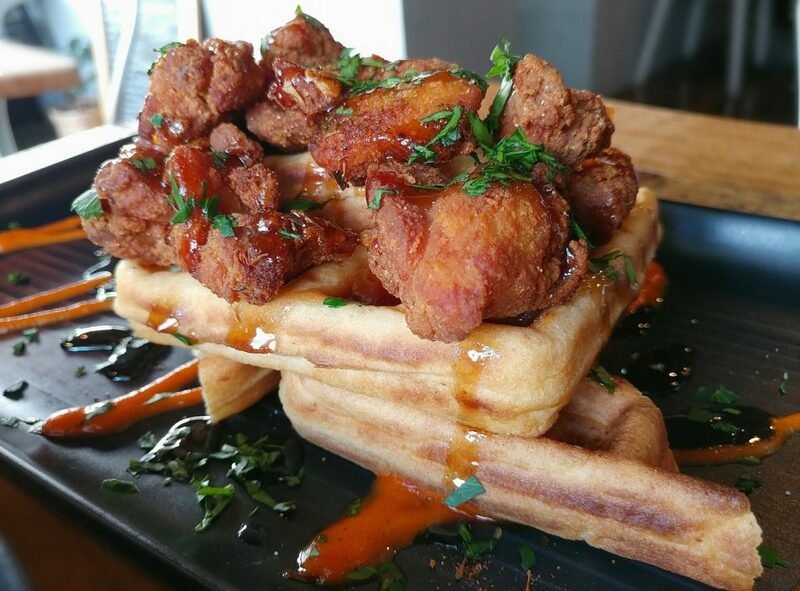 The chicken and waffles, drizzled in maple syrup. 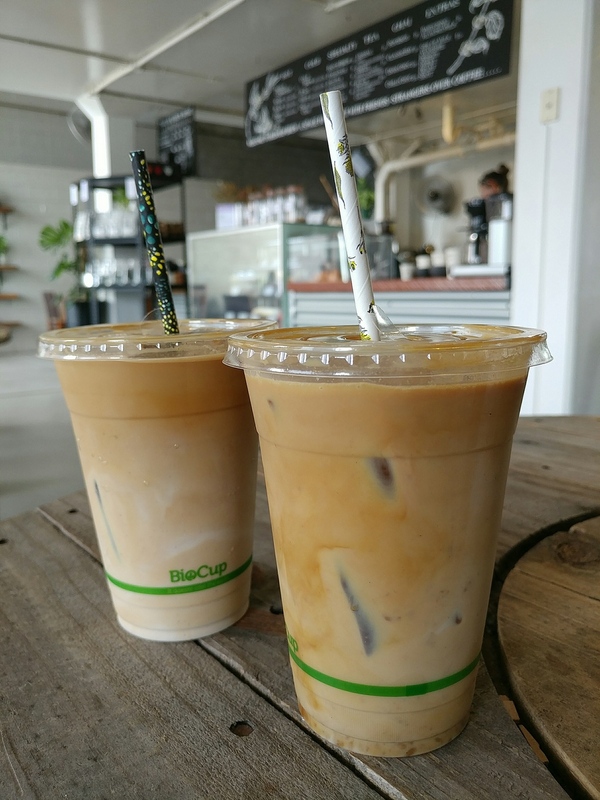 The owner of Duo, Tess, was welcoming and friendly, and as other patrons came by, we could see that there was certainly a local following, with regulars who came in for caffeination and a catch up. We felt well looked after, and it was evident that others did too. A summary of the meal. 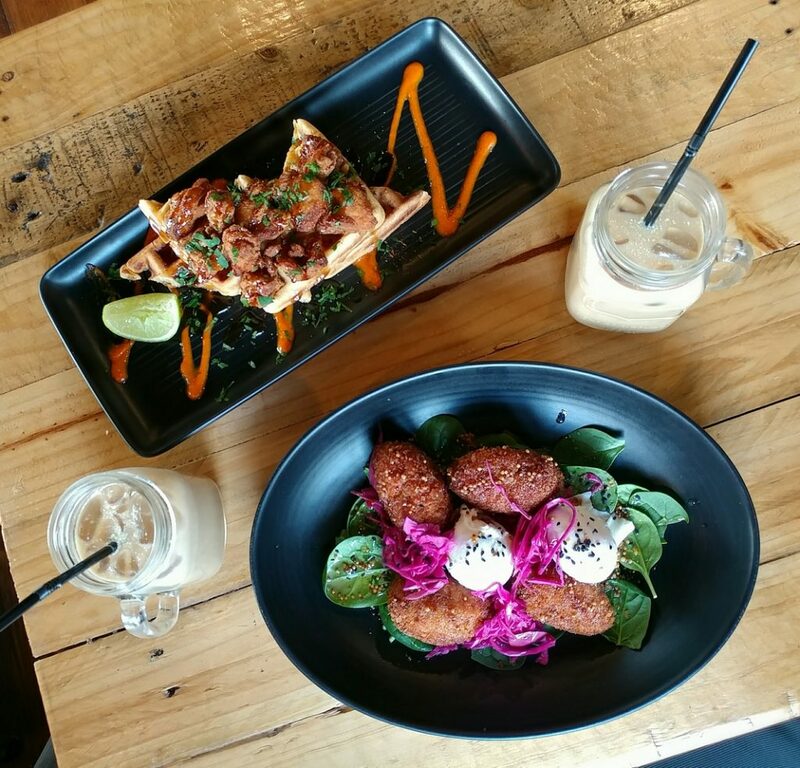 Duo West End offers some rather tasty brunch dishes, and nice coffee, with a side of warm hospitality. It is worth the detour to visit. Price point: $13 to $18 for food options more substantial than eggs on toast. Value: Pretty good, compared to similar elsewhere.